Emails were sent with this survey, if you didn't get it. Here ya go. I installed my amFilm yesterday. I am waiting the recommended 48 hours at least for it to settle. I guess I'll see what's up tomorrow night. Any luck with it? I installed the second screen about a day and a half ago. The battery was dying, and I figured a few hours wouldn't make a difference in the "curing" process so I put it in the dock to charge for about an hour. I just took it out and this one is also exhibiting the lines. I guess it's going back. I played 5 hours straight while docked after waiting 48 hours and it looks the same as when I first installed it. Flip back to page 6 for a more detailed response. I just saw this in case anyone was interested in doing this. However, I would be cautious and make sure you do your research on whatever cable you decide purchasing. If they are not USB-C compliant, they can actually do more harm than good in the long run. I'll have to do some research as well and see what extension cables meet the standards, but I do like the idea of the Switch being out of the dock to increase airflow and reduce heat; not to mention removing the possibility of the screen scratching because of it. This is exactly what I did. Different stand and cable. I figured someone would come up with same idea and post it. So it seems like the discussions have died down, so I wanted to pick it up again. How's everyone liking the Switch? Personally, I'm loving it and haven't touched any other system (I have PS4, Wii U, 3DS XL). My only gripes so far is the battery draining relatively quickly and joy-con connectivity (there have been a number of times where I have the system docked and in sleep mode, I take off the joy-cons, put them in the grip, press A to wake the system and it asks me to press L to activate the left joy-con but it doesn't respond. I have to take it off the grip and press the sync button to get it to work). It's another thing that the joy-con falters when playing cross-legged on the sofa and put the joy-cons too close to my legs at a distance of about 10 feet. Zelda: BotW: about 15 hours in and it's an awesome game and experience though I feel I'm doing a lot of shrine hunting and side quests which I feel pulls me away from the story. Fast RMX: put in about an hour, unlocked 3 stages and 3 additional vehicles. Definitely a lot of fun and scratches the itch of an F-Zero type game. Can definitely get frustrating when you fall or crash, but money well spent. Blaster Master Zero: beat the game after 6.5 hours. I never really got into the original game and this one had my attention the whole time. But it was pretty easy. VOEZ: I was really debating on not getting this because it's free on mobile (though if you want to unlock all the songs, it is paid which comes $5 less than the Switch version, I think). I've played about 15 songs on Easy, some very catchy. Hard mode makes things a little more fun and challenging. If you like rhythm and Hatsune Miku-like games, you would probably like this. There's not much in terms of visuals but it's a good change of pace compared to BotW and a game I usually play before bed. I've been playing a lot of Breath of the Wild. My schedule doesn't allow me to dig into it as much as I would like. (had to handle my taxes and other assorted paperwork over the weekend, as well as some maintenance work for some relatives) But I've really been enjoying what I have been playing. The freedom of exploration is really doing it for me. Last night I trekked across some snow-capped peaks that were obviously too high-level for me to actually be exploring. I was able to endure the cold thanks to some mid-level cold resistance dishes that I had prepared previously. But the enemies who popped up during this excursion basically laughed at the weapons I was packing. Thanks to this, I didn't stick around the snowy mountains for very long, but was able to locate a hidden shrine. I activated it in order to enable fast-travel, but didn't solve it because my cold resistance was wearing out. After that I drifted down to a nearby coastline, did a little excavating of some choice minerals I found, and then ran into a rock monster that I hadn't seen before. I had been forced to retreat from a previous encounter with this kind of mini-boss, but this time I was going in with some decent armor and upgraded bombs. After throwing myself at him a few times, and getting clobbered, I discovered that using a spear was considerably more effective, as it allowed me to reach the weak-point on his back, even when he was standing up. Sadly, I only had one spear, so I abandoned that encounter and explored further down the coast. I ran into a fairly large camp of bokoblins and moblins, one which seemed related to a quest I had already accepted. This encampment had a conveniently placed ridge of stone above it, where I could effectively hide. Rather than engage the enemies directly, I snuck behind the ridge, and started raining bombs down on them. This proved to be a good approach, as they turned out to be much too high level for engaging directly. It took a fair number of bombs to clean out most of them, and I attacked the remaining two enemies with sword and shield. One of the unforeseen benefits of clearing out this camp was an abundance of decent enemy spears. I was able to stuff my inventory with five or six spears. I returned to the rock monster with my new-found wealth of spears, and managed to finish him in fairly short order. Nice recap, Richard Kain. When I first played BotW, it reminded me of Ocarina of Time (which is my favorite Zelda game) and the ability to do a myriad of things (mini games-wise). I've also encountered a situation where the enemies are higher level and it took many bombs to take them out, but at the same time, it bothered me that I had to "cheese" my way through them (with the weapons and life I had at the time, I could get knocked out in a few hits). I guess in some ways, I like being given a path to travel with standard progression than to explore and get slaughtered or have to hide and whittle down an enemy. it bothered me that I had to "cheese" my way through them (with the weapons and life I had at the time, I could get knocked out in a few hits). This was something that I encountered last night. The rock monster that I ran into was too tough for me to tackle initially. I gave it a few tries, but after I had a better idea of what that encounter was going to take, I backed off. Later, when I had acquired the tools I felt that I needed, I returned and successfully implemented the strategy I had come up with. The cheese in the case is not a requirement, it's an option. I don't actually HAVE to cheese the enemy camp. If I wanted to, I could have gone off elsewhere until I had the health and power to punch in that weight class. But thanks to the flexibility of the game's various systems, I was able to experiment with the tools at hand to try to find an alternative solution. This flexibility appeals strongly to my desire for problem solving. My biggest issue with zelda is the lack of dungeons and any memorable boss fight. The open world is great but these 2 things make it feel less like a zelda game. No, I hear ya, Richard. It is definitely cool to approach a situation (or not) on your terms and also using different methods to approach the situation. Damn. I was starting to save up for a Switch but Apple announced a new iPad today that is 9.7", has the A9 chip, and is just $329. It would be a nice upgrade from my iPad 3. Perhaps I can wait till the fall for a Switch. Damn for that price I think I may finally have to buy an iPad. As for the Switch, I am still loving the system and have mostly been playing Zelda, over 40 hours in now and still loving the game. I've also got Fast Racing RMX, Bomberman, Binding of Issac, and Blaster Master. I've played several hours of Issac and it's fantastic on the Switch. Blaster Master is easy, but fun. I have not played much Bomberman, haven't had a scenario to play with 4 or more people yet, which is probably the only way I will ever care to play this game. The single player for Bomberman is not good and I've enjoyed Fast RMX, but just haven't played much of it due to being into other games mainly Zelda and Issac. 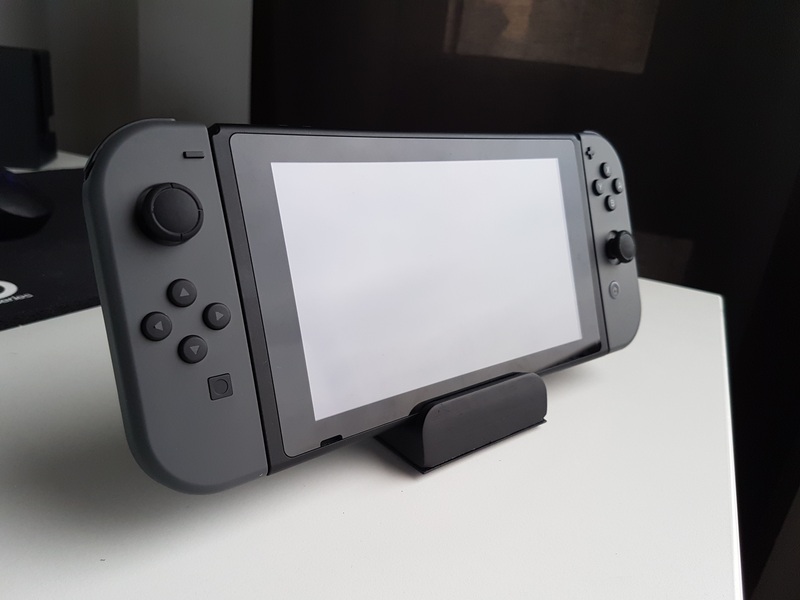 I love this far more then the current looking Switch's dock that someone made. 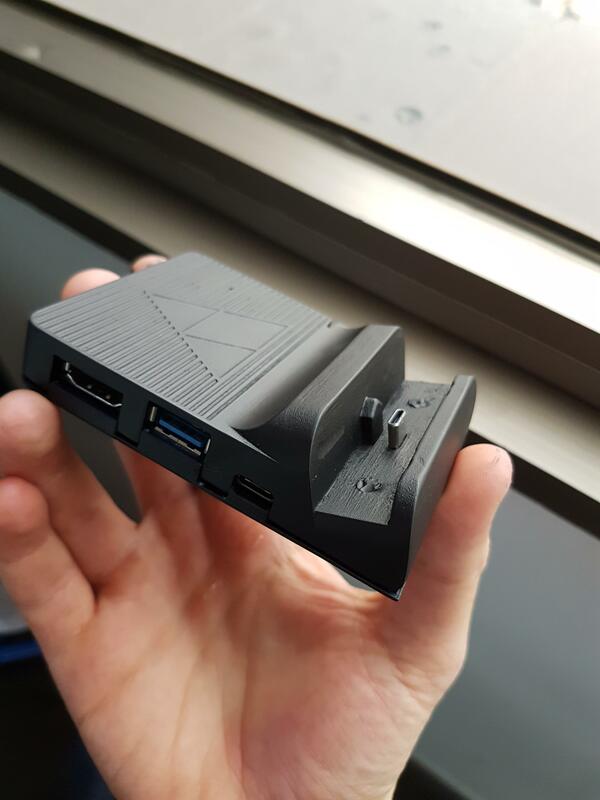 If you decide to make a limited run of these, or would be accepting payment for people to ship their docks your way... (and compensate you for your time and services, of course) I'd gladly pay for that miniature alternative! I'll do a little production of 50 (to start), with detailed instructions. Tomorrow i'm gonna ask some injection providers." With the amount of amazing games Sony has gotten this year seems like an odd time to get rid of our PS4. I'm enjoying my Switch, but I definitely wouldn't get rid of my PS4. Especially not with the collection of games I have for it. Maybe it's just me, but I don't understand people who actually want to only have one system. Having just one system is the kind of thing you put up with when money is scarce and you have to tighten your belt and make some tough choices. But if the disposable income is present, I don't know why you wouldn't buy at least two systems, possibly more. I think Microsoft is suffering the worst at the moment, as the XBox One just isn't delivering when it comes to exclusive content. Sony's doing just fine, with a number of high-quality exclusives, and some of the best multi-platform support thanks to some very good low-level tech decisions that they made early on. Nintendo is Nintendo, and will always have a certain number of must-have exclusive titles. I finally got in the screen protectors that I had ordered, and applied one of them tonight after carefully cleaning my screen. It went on smoothly, and seems to be just fine. After some of the tales on the boards, I'll wait a while to put it back in the dock for an extended period of time, but for now it is looking good. I got a tempered glass protector, and it feels a lot better now to touch the screen. Interesting.For me king of consoles was 360. I very thoroughly enjoy my X1 however and got rid of my PS4 as it was collecting dust. In my household, there is no mentions of Sony.. lol. PS3 was a just a toy bed mostly for me to play with modding, etc. but all of my gaming was on Microsoft consoles. My house will always be a microsoft shop. I also got my Wii specifically to just play my GC games with progressive and play with homebrew, etc. Maybe the occasional Mario Kart but I had no interest whatsoever in the Wii controls or specific games. Absolutely zero interest in Wii-U but back on the train with Switch. There is a part of me however that wished the Switch innards were more modern tech. Nintendo always seems to lag behind and it irritates me to hell. I do have a PC to satisfy my itch to play more "modern" games such as Forza and Rise of the Tomb Raider, not to mention they are much cheaper to own on the PC. What does this even mean? It really just sounds like fantasy nonsense. Nintendo hasn't "optimized the maximum output", in fact they bungled many aspects of the Switch design, from screens that are easily scratched by their own pack-in dock, to joycon connectivity issues, poor wifi performance, poor placement of the charging port, cheap materials, etc. And despite the mysterious hopes of "hidden power" in Nintendo hardware (remember how people kept claiming that the Wii U had magical powers hidden within its chips? ), the reality is that Nintendo's philosophy has always been to keep their hardware at a bare minimum, to keep costs down and profits up. They did this with the Wii, Wii U, and now the Switch. There's no magic inside, just the usual mediocre hardware. Nothing more. Everytime Nintendo makes a hot item it makes people really angry... Wonder why that is. if you wish to send yours in to get it repaired/replaced and the issue won't exists going forward. They did this with the Wii, Wii U, and now the Switch. There's no magic inside, just the usual mediocre hardware. Nothing more. It is true that there isn't going to be any "hidden power" in the Switch. Anyone expecting such performance would do best to forget about it, it isn't happening. At the same time, it is far too dismissive to call Nintendo's hardware "mediocre." Nintendo has always made solid, quality hardware. They frequently design their systems with dated hardware that doesn't focus on sheer performance, this is very true. It is their standard approach to game system development. But their hardware platforms have always been exceptionally well designed, even if they don't push performance. Performance is not the sole standard of quality for hardware. One of Nintendo's hallmarks has always been solid hardware with unusually high stability and durability. This priority is so pronounced that it was a key factor in preventing Nintendo from transitioning into optical media. But history bears out this focus, and Nintendo hardware failure rates have always been much lower than their competition. The hardware for the Switch is not mediocre. To call it underpowered when measured up to its closest competition would be accurate. But mediocre is not fair. In addition, SwitchForce on YouTube made a video of the issue and what Nintendo has done to fix it (repaired left joy-con opened).